Welcome to the OFFICIAL website for the Liverpool Open Darts League. while sixth placed Arkles beat Glasshouse. 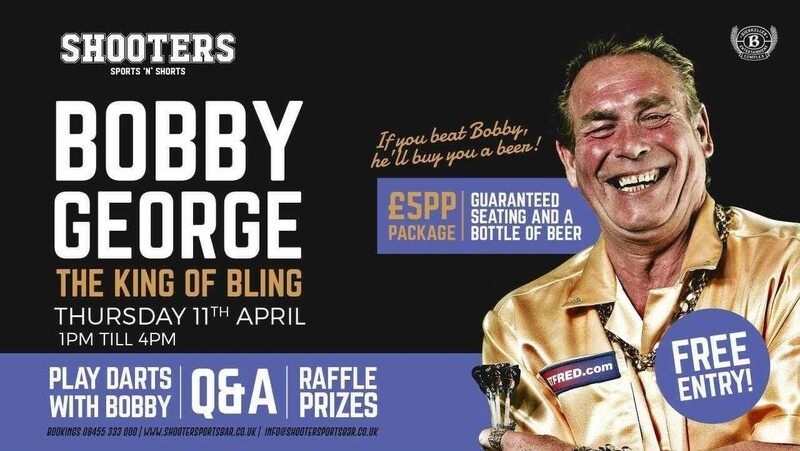 At Bierkeller there is an incredible event - Play darts with Bobby George. £5.00pp Table Packages available including Reserved Seating and Bottle of Beer. Gateway beat Peg Legs, Arkles beat Village and Masons beat Glasshouse. Newstead "A" to go level with QOM after beating Newstead "B" in the local derby. Its with regret I have too inform members of the league of the sad passing away of Alf Clarke. also was a member of the committee for a number of years. Heartfelt condolences to Alf's wife and family. Queen of Marytyrs who now go level with Claremont but having played three games more. Elsewhere Liver Vaults beat Masons and Peg Legs beat Glasshouse. meeting and is now on the web site. Four blocks of four with ONE winner per block. two teams tied in second place met with Queen of Martyrs coming out on top over Newstead "A". beat Newstead "B". The game between Peg Legs and Masons was postponed. four blocks of four to be played down to one winner per block. Matches to be played on March 11th. coin to decide order of play. just below the top three. At the bottom there were defeats for Newstead "B", Ship & Mitre and Glasshouse. Congratulations to the winners of the final qualifying round. over Newstead "B" and Arkles while Village beat Glasshouse. Geddes of Peg Legs being the highlight. right to the wire and Queen of Martyrs overcome Gateway. Arkles. Further down the league Masons beat Village Inn and Glasshouse beat Ship & Mitre. FOUR blocks of EIGHT players with ONE WINNER per block and is to be played on February 18th. matches to be played after league match. maintained their winning streak with a victory over Arkles. Newstead "B". Just above them Liver Vaults beat Village Inn and Masons beat Ship & Mitre. level on points with Claremont but having played three games more. Peg Legs over Village Inn, Masons over Newstead "B" and Liver Vaults over Ship & Mitre. The draw for the next round of the individuals has been made and is now on the comps tab. league and their families a Merry Christmas and a Happy New Year. Peg Legs over Ship and Mitre and Liver Vaults over Newstead "B". Peg Legs   v  Newstead "A"
Arkles over Glasshouse and Peg Legs over Newstead "B". Peg Legs and Queen of Martyrs. There was one rearranged league game last night with Gateway beating Liver Vaults. Newstead "B". Peg Legs beat Gateway, Arkles beat Village and Queen of Martyrs beat Liver Vaults. At the bottom Glasshouse were beaten by Masons. on top. Glasshouse recorded only their second victory of the season with a win over Liver Vaults. Peg Legs beat Queen of Martyrs, Masons beat Arkles and Village Inn beat Ship & Mitre. were wins for Arkles over Liver Vaults, Peg Legs over Masons and Ship & Mitre over Newstead "B". Village "B"      v Masons "A"
Newstead "A" "B" v Claremont "A"
Gateway "B"      v Newstead "A" "A"
Peg Legs "A"     v Queen of Martyrs "B"
Ship & Mitre. Gateway's win at Newstead "B" means that they also stay just behind the leaders. In the one remaining game of the night Arkles defeated Peg Legs. been posted on the website. Matches to take place on the board of the first named player. There are 41 matches and 23 byes. There are NO BLOCKS. Peg legs and Arkles. Masons beat Village Inn and Ship & Mitre beat Glasshouse. remain bottom of the table. entries for Individuals, Pairs and five-a-side competitions. second place. At the bottom there are still no points for Newstead "B" who were beaten by Masons. Elsewhere Peg Legs beat Village Inn and Liver Vaults beat Ship & Mitre. Village Inn   beat Newstead "B"
Gateway over Masons and Peg Legs over Ship & Mitre. The draw for the first round of this year's Presidents Cup was made at the Arkles last night. Village Inn   v Newstead "B"
there were byes for Gateway, Newstead "A", Liver Vaults and Queen of Martyrs. Matches to be played on Monday 3rd September. Glasshouse and Village Inn against Arkles. Peg Legs, Masons beat Arkles and Liver Vaults beat Glasshouse. and Liver Vaults beat Masons. with Gateway beating Village Inn and Newstead "A" beating Queen of Martys. were wins for Arkles over Liver Vaults and Ship & Mitre over Newstead "B". Grahame - this should have been John Garbe. The details on the website are correct. It will now take place tomorrow night (July 4th) at 7pm in The Newstead. The new season will start on Monday 16th July. teams three times. The third match will be played to Presidents Cup rules. June and beginning of July. will need to be returned at the September meeting.